The beginnings of Lacoste date back to 1933 when the clothing company was founded by René Lacoste, a famous French tennis player. Starting out with a signature tennis shirt, the brand has retained its popularity ever since. In the past decades, Lacoste has become a huge international presence, including a variety of products in their lines, including eyewear, accessories, footwear, perfumes and watches. 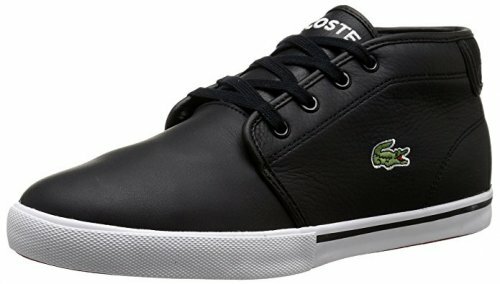 Lacoste shoes, however, hold a special place among all of these, seeing that they’re often the first choice of those looking for simple, sporty style that is comfortable and comes at a great price. These canvas loafers are a classic style that looks gorgeous and is simple to wear, take care of and pair with any of your favorite clothes. Available in 12 solid color options, you can get the ones that will fit your style the most, and thanks to their simple design they will work just as well for outings with friends, running errands, office-wear, as well as on formal occasions paired with a dressed up ensemble. Although envisioned as a resort-ready style, you’re sure to find yourself reaching for these in spring and fall as well. At just 10 ounces, the Marice is a great option that will allow you to go longer and further as it won’t weigh you down. The canvas upper is both flexible and breathable, and won’t constrict your feet when the heat is high and you’ve still got tons of things to get done. You’ll definitely love the collapsible heel which will allow you to wear these as a pair of slippers, just in case you want to be out the door extra quick. The sole on the Marice is quite thick, despite the fact that these slip-ons were designed for casual use. Nonetheless, this is a welcome addition, seeing that it protects your feet better, but also cushions your steps so that you’re less fatigued at the end of the day. The Marice is a good choice for anyone looking for a stylish but versatile pair of slip-ons that’ll work with all types of outfits. They’re particularly good for summer use, and will even be great for travel, seeing that they easily go from loafers to slippers thanks to the collapsible heel. The Carnaby EVO is a classic tennis shoe that is available in a variety of uppers, colors, and prints, making it the perfect option for anyone looking for a great design that will fit their own personal style. You can get them in a perforated upper version, pearlized, or even textured leather, depending on what you need. The round toe and white stitched rubber outsole bring the look together, giving you a great design that works with jeans just as well as it does with a dress. There are several options when it comes to the Carnaby EVO, and all look amazing. Whether you go with a simple, single-color upper or get a pair that features embellishments and decorative stitches, you’re getting that classic style that’s timeless and goes with everything. Originally intended as a tennis shoe, the Carnaby EVO retains the outsole that made it work on the court - it offers great traction that doesn’t easily go away, while the pivot point allows for easier movement. The Carnaby EVO is a great alternative to other options you might be considering, seeing that it gives the advantages of both functionality and style, utilizing premium materials, all without going overboard with the price. While the Helaine is advertised as a running sneaker - and certainly is tough enough to endure that - we’re inclined to say that thanks to its sleek, preppy exterior, this is more of a lifestyle design than any other. The Helaine is a combination of canvas and synthetic materials, together with an EVA outsole that is light in weight, and it will provide you with the ultimate energy boost. The canvas on the Helaine is a breathable fabric, which allows air to properly flow in and out of the design and keep your feet cool and dry. The laces are there for adjustability, and they are waxed so they can last longer. The outsole is made from EVA, as we mentioned, and it has special tread patterns on the bottom which ensure that you don’t slip or skid on any type of surface. The Helaine sneaker is a perfect way to finish off all of your sporty looks. In fact, you can even go a step further and pair them with your favorite skirt or sundress, for an ultimate play on urban chic! There is nothing you can’t achieve in this versatile option, and you will love wearing it day in and day out. Similar to the Marice, comes a ballet flat style that’s a great choice for both casual and professional wear, and will become one of your go-to choices thanks to its design and comfiness. The Marthe is made with a premium canvas upper that is not only lightweight, but also allows excellent airflow, making these a great option for hot summer days when you don’t want something constricting. Featuring an embroidered crocodile on the back of the heel, the Marthe foregoes the flashy logos that are often found on athletic footwear. No matter which of the color options you go with, the branding won’t clash with your outfit, allowing you to wear these to a variety of places. The most reliable footwear brands use vulcanized rubber outsoles in order to provide their users with the durability and dependability they need. Vulcanization is essentially cooking rubber to a very high temperature in order to craft the sole, making it more resilient as well as allowing it to perform better on slick surfaces. The Marthe is an option that comes at a low price, making it a great pair of Lacoste flats to try out the brand. The craftsmanship is of very high quality and the materials used match perfectly with a variety of clothing options. The Ray is another tennis sneaker, but this time without the heavy, chunky rubber outsole. These are flexible and lightweight, making them the perfect summer footwear option, great for long walks and even travel. It’s available in a lace-up version, as well as one with a hook and loop closure, which means that you can adjust the fit to suit you just perfect. The Rey features a padded footbed that does two things: one, it is soft to the touch and comforts your foot throughout the day. Two, it has a role in the absorption of shock, lessening the impact of each of your steps and preventing too much joint or muscle pain. The Reys are designed to be spacious as the rounded toe provides plenty of room for your toes to spread out. Additionally, rounded toes are great for protecting the wearer, as they're usually padded with extra layers of rubber. The Rey is a great option for those who need a good pair of summer footwear, and are a fan of leather for its breathability and comfort properties. Furthermore, it’s available in two types of closures, making it a good choice for those who prefer to forego laces. Inspired by a design that has made a comeback in recent years, the L.12.12 is crafted from premium materials for a luxurious sneaker that will work great for all types of use. Available in a number of looks - from classic white leather to colored canvas to perforated and even to monochrome - it’s a fashion statement that feels amazing on your feet at the same time. It’s even available in children’s sizes, making it a great option for the whole family. The lining on the L.12.12 is made from a warm canvas material that will allow you to wear these court sneakers even when the temperature drops. Paired with the 100% leather upper, you get a pair of that will keep you warm without overheating. While all the colorways of the L.12.12 look great, the monochrome options do stand out, bringing something completely unique to the classic tennis style. Pair these with some jeans or a suit and you’re guaranteed to look amazing. The L.12.12 is one of the brand's newest releases, which means that the price of this sneaker is higher than some other styles featured on our top ten list. Nonetheless, considering the fact that they make for the perfect cold weather option, this is a sneaker that you can easily invest in, knowing that you’ll get good use out of it. Inspired by the classic tennis style with its simple white leather upper and minimalistic upper, the Straightset is the best choice if you’re looking for something classic that looks just as good with a pair of jeans as it does with dress pants or even a suit. Made with a premium leather upper, it’ll hold up well against time, and will offer plenty of protection no matter the season. Using high-quality rubber in the outsole and the cupsole of these sneakers, the Straightset is a great choice for use on all types of terrains. It won’t wear down as easily, while the heel cup will cradle the foot, preventing any slippage that might cause injury or discomfort. A touch of leather in any design can go quite a long way in affecting the look as a whole. This brand composes the uppers of the Straightset from high-quality leather in order to contrast with the piqué engineered collar to create a beautiful look. Considering that this is a classic, premium leather tennis sneaker, the fact that it comes with a higher cost is no surprise. Nonetheless, you’ll find that the Straightset is less expensive than similar styles by competing brands, making it a great choice if you’re looking for a pair of stylish casual footwear. While most footwear made by Lacoste is more focused on style than function, the LT Fit is a great option for those looking for a pair of sports sneakers they can use for more demanding activities such as walking, training or even running. Made with a canvas upper, these sneakers feature a modern silhouette that is minimalistic both in appearance and weight - making these a good choice for travel as well as for everyday use. Making use of EVA foam in the soles, the LT Fit allows you to train, walk or even run without having to worry about any pain in the knees, hips or back. The EVA foam will absorb the shock from all of your impacts, giving you a soft, cushioned experience you will fall in love with. Considering that the rubber outsole of the LT Fit is non-slip, these are a great choice for professional use in environments where you have to walk on slick surfaces such as tile or hardwood floors. The LT Fit is a truly great investment, as it offers both style and functionality in a package that is affordable for most people. It’s a particularly good choice for those who lead an active lifestyle and spend a lot of time standing or walking. The Ampthill was inspired by the classic chukka boot, giving it a dressy-casual look that works so well with a wide variety of outfits. Made with a leather upper that is soft to the touch, offers excellent protection during the colder months, and contributes to the durability of this design, the Ampthill is definitely a solid choice of everyday sneakers that look and feel great. Thanks to the high level of comfort the Ampthill offers, you may find that these will become your go-to choice for all occasions. The lining in the Ampthill is composed of what's called "twill", which is essentially a mix of fabrics resulting in a very soft material that feels good in contact with the foot. Making this mid sneaker even more wearable is the Ortholite insole which cushions and comforts the foot, all the while wicking away moisture and preventing bad odors. The collar of the Ampthill is generously padded, making for a more enjoyable wearing experience that will prevent any rubbing or blisters. Even more, the tongue features plush padding as well, which means that no matter how tight you tie the laces, they won’t cut into the tops of your feet. The Ampthill mid sneaker is a great choice if you’re looking for something that’ll work in spring and fall, or even during mild winters. Its cost is average when compared to other footwear in this guide, and the materials used are all of premium quality, so you can be sure that you get a dependable product that is one of the most comfortable options on this list. These leather slip-on loafers are an amazing choice seeing that they’re easy to wear and provide great comfort levels for long periods of wear. Available in white, navy and black, they’re a classic choice with a twist, that’ll work great for spring and fall thanks to the materials used. With a padded collar, you are sure to find these comfortable, seeing that they won’t dig into the back of your heel or ankle, allowing a better wearing experience. Like most slip-on styles, the Gazon features two elastic gussets which have the function of providing you with a higher level of comfort while walking. Additionally, this will make it easier to put these loafers on and off, eliminating the need to waste time on laces or straps. While the upper is made with soft nappa leather that molds to the feet and feels great, the inside of the Gazon is lined with cotton canvas, ensuring that the material in contact with your foot is soft and cool, allowing for plenty of airflow. Considering that it’s made with a premium leather upper, the Gazon is a pair of loafers that can be bought for quite a low price. You’ll find that they rank low on this list when it comes to cost, which is great for anyone looking for an affordable pair of Lacoste footwear. Considering the fact that Lacoste is a brand which first started making equipment for tennis players, it comes as no surprise that the majority of their footwear is made with athletic use in mind. Their tennis shoe inspired sneakers all make use of classic, timeless silhouettes that are easily paired both with completely casual outfits, as well as more formal ensembles. The Lacoste brand can easily be defined as sporty with a high-end twist, which is why loafers are some of their most popular products. These moccasin shaped slip on shoes go great with a variety of outfits, both formal and casual, and are a type of resort-ready footwear that brings comfort, practicality and style together. A lot of their loafers and flats have adjustable features, such as a collapsible heel, which allows them to be worn in a greater variety of situations. As a brand which invests a lot in developing high quality resort wear, it is only understandable that some of their most loved products include slide slippers made for water friendly use at the beach, pool, or even your own boat. Using synthetic materials that work well in these types of environments, Lacoste creates looks that are not just functional, but also very simple and easy to pair. Materials are a big factor when considering the overall build and look of a particular shoe. High-quality materials in combination with high-quality stitching can make a huge difference in how the shoe itself looks as a whole. Even more, the materials used in the construction of a pair of footwear can determine whether it’s a piece that’ll last for a few wears, or if it will become a signature item worn for a number of years. Canvas is perhaps of one of the more popular choices in terms of materials used in casual type shoes as it looks quite nice, is lightweight, and is fairly cheap to produce. The materials itself is created from a mixture of fabrics which is where it gets it’s lightweight build and subtle look. One of the reasons canvas is a good option is that it’s not too hot, and it allows for great breathability, both of which are crucial during summer use. With canvas shoe uppers, as well as canvas linings, the moisture that is generated by your feet has the opportunity to escape, leaving you dry, less hot, and ultimately healthier. Leather is known to be the more expensive and elegant option in terms of shoe materials as it looks great and has some natural properties that make it one of the best materials for footwear on the whole. One of the most important features of leather is that it is a flexible material that can be perfectly broken in – you will find that leather shoes will mold to your feet after a few wears, giving you the perfect custom fit that won’t cause any pain or discomfort. Additionally, leather is naturally breathable and prevents overheating, but is warm and thick enough to be protective, which is why it’s often used in making sports equipment. One downside of leather, however, is the fact that you need to take proper care of it, only using the appropriate cleaning techniques and products, in order to ensure its longevity. Almost all Lacoste footwear will use rubber to some extent. Most models on this list use rubber in the outsole portion of the shoe, which is understandable as this is a material that is both durable and flexible, allowing for good protection and ease of movement. Another reason why rubber is often used in Lacoste shoes is that it has excellent shock absorbing properties, making it more comfortable to wear these shoes for prolonged periods of time. Recently, Lacoste and Ortholite have announced their collaboration, stating that all Lacoste sports footwear will now feature the famous Ortholite insole in order to provide users with an even higher level of comfort and cushioning. This is great news for anyone who values a good insole, and is a popular choice for many sportswear companies including Nike, Timberland, adidas, Salomon, Puma, New Balance, Reebok, Under Armour and many more. Considering the fact that this is something completely new for the French brand, you’re in luck, especially if you want your favorite pair of shoes to be both comfortable and stylish. Whether you’ve decided to get some tennis sneakers, loafers or athletic shoes, you’re bound to benefit from having a better insole. Ortholite insoles are made with foam components that serve two purposes. One is to keep your feet supported, especially in the arch area where they hug your foot, preventing it from overpronating. The second is to cushion each of your steps or landings, absorbing the shock that naturally generated on impact. This helps protect your heel, the entirety of your foot, as well as your ankles, knees, hips and back. If you’ve ever found that your joints or muscles hurt after a long day of standing or walking, this was probably due to your shoes not providing enough cushioning for your needs. The insoles are made so that their quality and performance do not decrease over time. Most other brands will see a reduced flexibility in their products (often referred to as packing) however, Ortholite’s products will retain more than 95% of their original thickness, thanks to being able to spring back to their original form after every wear. Additionally, Ortholite insoles use moisture wicking materials in the lining, allowing for better air flow and evaporation, giving you a dry and cool pair of shoes that will stay odor free more easily. This is also important in that it can prevent the growth of bacteria in your shoes that would otherwise become potential health threats, causing issues such as infections or athlete’s foot. The best part, though? These insoles are washable, which means that you can keep them clean more easily than any other! Footwear made by this French brand is quite simple in its design, most often utilizing canvas or leather materials for the upper, creating beautiful silhouettes without the overuse of colors or embellishments. That’s why Lacoste is such a popular choice among those who like to own a few key pieces that can be easily paired with any of their favorite outfits, and that will work equally well in casual and formal settings. If you’re after some classic sporty style that will work well for more than just casual occasions, then this is a brand that you should definitely consider for your next purchase. Lacoste is a brand that is focused on high end looks and feel. This means that while they may not have durability as their main goal, they should last you quite some time with the proper care. q: How do I clean my Lacoste footwear? Depending on whether or not the shoes are leather, the process of cleaning them will vary based on the type of materials. For the most part, Lacoste even recommends refraining from hand washing/machine washing their shoes as it can cause inconsistencies in the dye. If however, your shoes are leather, we have a guide here to help you out. q: How do I extend the lifetime of designer shoes like these? This really all depends on how you treat your shoes as well as how often you clean them. Measures can also be taken to weatherproof your shoes by means of particular sprays as well as taking your shoes to a cobbler if anything major happens. q: Are there any special care instructions I should follow? Check with Lacoste directly. On their website, they have care guides that explain which types of cleaners and methods to use to keep your shoes looking their best. q: Can I buy a size up or down if I can't find my size online? We don't recommend it-- it's a sure way to develop foot conditions that will do damage over time, not to mention, leave you completely uncomfortable!